“One thing is certain,” said the Daily Mail. Tuesday was “not a good day for democracy”. 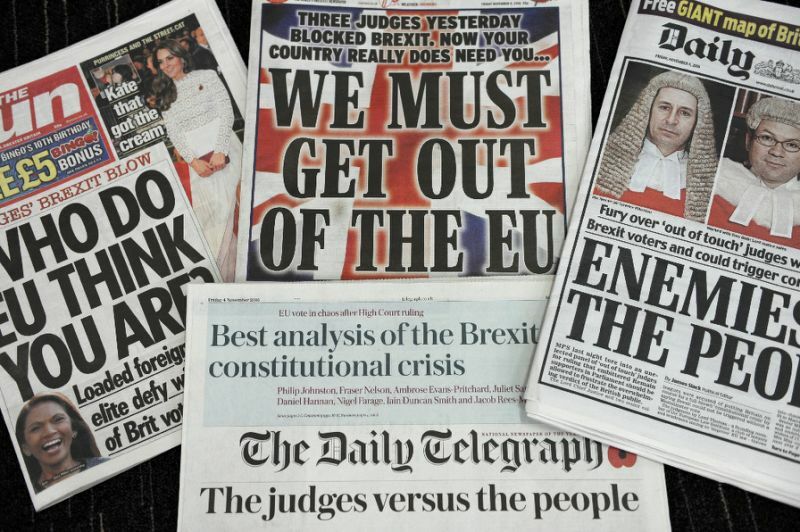 It was the day when eight Supreme Court judges opposed by three dissenters – handed MPs and peers the right to “overturn” the wishes of 17.4 million voters who opted last June to leave the EU. The court “bowed to the wishes” of Gina Miller, the “gloating investment manager” who brought the case, and ruled that only Parliament can trigger Brexit even though both sides in the referendum campaign insisted the result would be binding. In so doing, the Court “handed a weapon to Remoaners in both Houses who are determined to frustrate the will of the people by delaying Brexit or watering it down”. Of course, the judges say that they were only guided by the law; but “it is impossible for anyone to be perfectly neutral”, and no doubt they were swayed by their “rarified”, pro-EU backgrounds. Rubbish, said The Times. The Supreme Court decision “should be cause for celebration among Remainers and Brexiteers alike”. It upheld the principle of parliamentary sovereignty, which was “at the very centre of the original referendum debate”. Since at least the Bill of Rights of 1689, it has been a “pillar” of the British constitution that laws may not be changed, nor citizens deprived of their rights, without a vote in Parliament. Triggering Article 50 of the Lisbon Treaty will mean that we leave the EU within two years, which will inevitably change the law; a vote is clearly necessary. Besides, Miller’s victory won’t make much difference, said Matthew Norman in The Independent. The new Brexit bill which is to be debated next week will give MPs and peers “a chance to look busy”. But that’s about all. Jeremy Corbyn has promised to support the Bill. So if you add together the “only Tory in the No lobby” (Ken Clarke) to a few Labour “refuseniks”, the SNP, a small band of Lib Dems and the Greens’ Caroline Lucas, the opposition barely reaches 150. “Even at its most truculent, the House of Lords would struggle to ignore a Commons majority of 500.” The most that Remainers can hope for are a handful of amendments “to soften Brexit at the margins”. The ruling certainly made an impact in Scotland, Wales and Northern Ireland, said Michael Hugh Walker in The Independent: all 11 justices rejected the request of the devolved assemblies to be consulted on leaving the EU. This was expected, but it confirms that the rest of the UK is “consigned to a destiny” over which it has no influence. Politicians in Edinburgh, Cardiff and Belfast are “frustrated, angry and worried at the prospect of a Brexit guided solely by English politicians swayed by hard Brexit sentiments”. But thanks to the Supreme Court, Parliament will scrutinise the Brexit process more closely, said The Guardian. This is only right. The referendum result was clear. But it cannot be the last word on this “complex, changing and hugely important subject”. Parliament must “rise to the responsibility that the judges have placed upon it. Its duty is to lead, not follow”.